ESCKAZ motto is "Delivering Eurovision News First". As usual our team will be officially accredited and providing "Euroweek" from the beginning till the end in complete details. This year, we're aiming again to bring the independent Russian and English blogs - our English team is made of ESCKAZ senior editors Mike and Daniel and introducing our new special guest blogger - Dimi. Russian team as usual will be lead by editor-in-chief Andy Mikheev. Daily, from April 25 till May 11 on ESCKAZ.com COPENHAGEN BLOG you'll be able to find the latest information directly from Eurovision 2014 capital: reports on rehearsals, press-conferences of participants, fan and other events. We will also try to report on events happening outside the press-center, Euroclub and Arena in the city. Previous ESCKAZ.com live coverages has been number of times nominated as Best Eurovision Blog, so we'll try to keep standart equally high in 2014 as well. Full schedule of rehearsals, press-conferences and other events is available at ESCKAZ Eurovision 2014 guide. This page will NOT be updated during Euroweek period, so please, bookmark our blog. As usual, shortly before the contest ESCKAZ team presents website ranking of the participating entries. 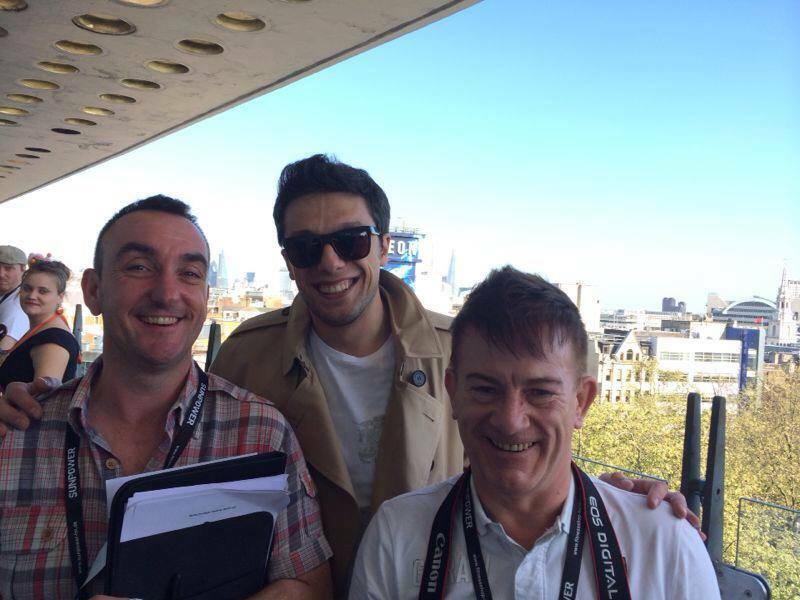 This year is no different, and this year all entries are reviewed by Eurovision expert Andy Mikheev and British editors of the website Mike & Daniel. We also present you the final outcome of ESCKAZ visitors' poll 2014. With Eurovision delegations gathering in Copenhagen from Saturday and first rehearsals starting on Monday, it is time to wrap up coverage of the intermediate period between National selections season and Euroweek. So, briefly, who are the favourites to win this year? Bookmakers are certain - Eurovision will return to Caucasus and for the first time Armenia will be the winner. It has been topping the odds since presentation of Aram Mp3's entry. Current odds on Armenia are 6/5-6/4. Sweden has been recently shortening odds and currently is offered at 2-5/2. They are followed by Denmark, Norway, UK and Ukraine, which is the highest CIS country in odds. Azerbaijan is at 8, Russia at 13, while Belarus, Moldova and Georgia are regarded among outsiders of the competition. Sweden gets runaway victory in OGAE voting. Top 5 is currently made of Austria, Hungary, Israel and UK. Armenia is currently on 6th position. The last votes will be revealed on the morning of Monday, April 28. Fan polls have been quickly loosing it's effect since the introduction of OGAE vote, but currently most active ones at ESCStats and ESCNation show same top 3, being UK, Sweden and Hungary, though in different order. Armenia comes on 4-5th position. 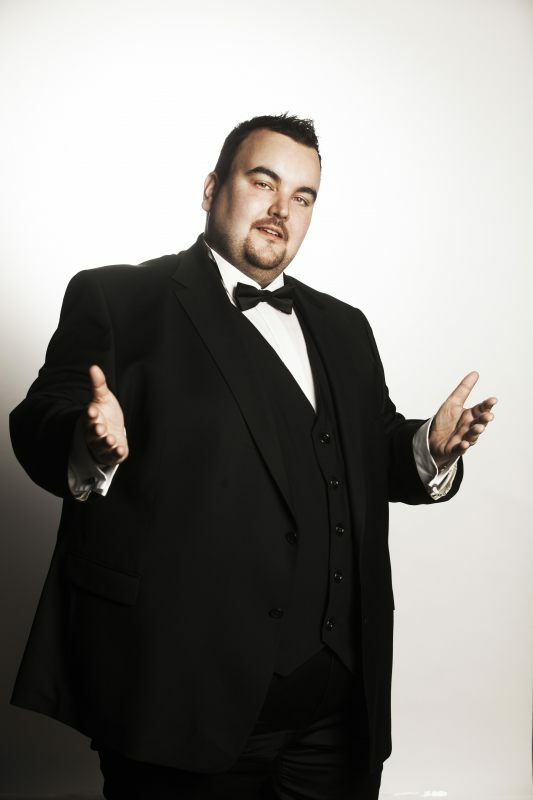 We usually also mention the most touring contestants. Promotional tours clearly have been loosing popularity as it is all but proved that they have no effects on the final results. Anyway, contestant from Armenia visited 10 countries and Azerbaijani entrant - 6. We're also incredibly honoured that this year in the preparational period we have published in text or video format interviews with 36 out of 37 participating artists (unfortunately the only one missing was Italy). 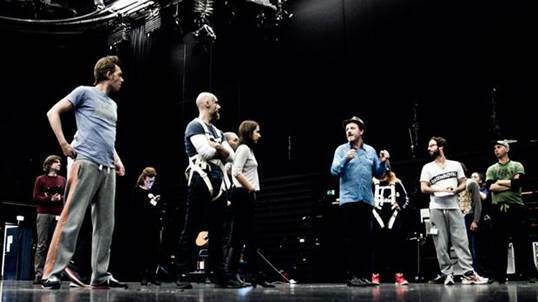 Danish press was for the first time today invited inside B&W Hallerne to witness Eurovision 2014 stage. The stage has been revealed by show manager Jan Lagermand Lundme and producer Per Zachariassen at a press conference in B & W Halls on Refshaleøen. 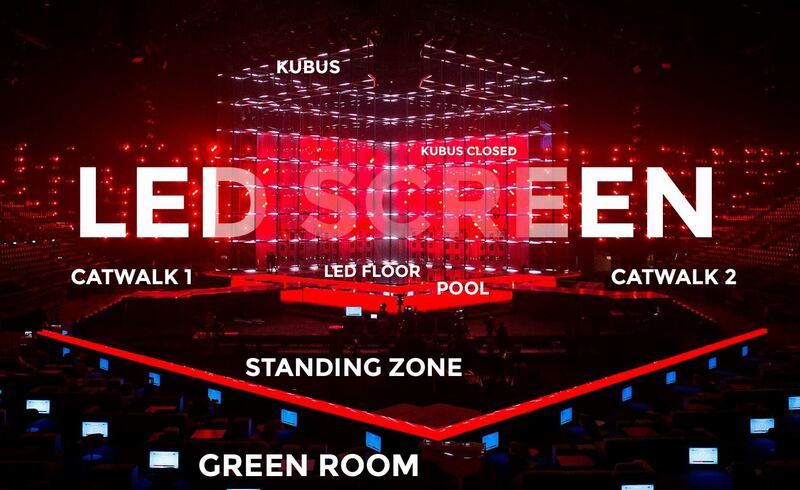 Eurovision stage consists of an illuminated cube, which may become transparent at times. Behind it stands a wall of lights and LED screens - and in front it is filled with water. 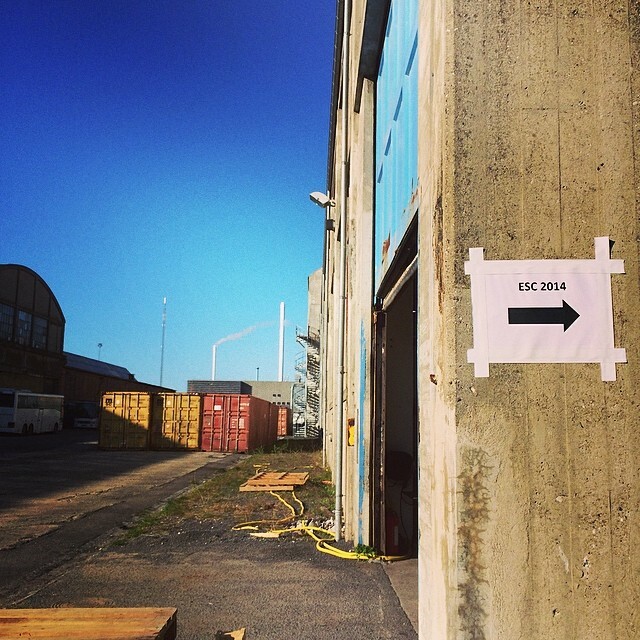 The inspiration, according to the set designer Claus Zier comes from the bow of a ship cutting through the water. The scene is a large 'cube' that is hollowed out so that each of the 37 artists can stand in the middle of it, or go full out to the crowd of 10,000 spectators. The stage is 35 meters wide and 20 meters high, with catwalks extending 16 meters out into the hall. As background, it has a giant LED rear wing, 100 meters long and 13 meter high, that can display pictures and animation during the show. The cube is built up of 120 cube-shaped modules, and is coated with a specific form of the projection film, which makes it possible to give the cube several different terms: It can either be transparent, so you can look through the cube and see the big LED screen in the background, or it can also be used to project images and movies on it, so the cube turns into a small, enclosed room. There are also mounted 10 dance floors in the cube, which one can get to via long ladders on back side of the cube. So that may properly come to life in the big cube. The stage floor can be used to create visual effects: It consists of a 13 x 13 meter interactive LED surface which react as a touch screen, and for example creating the illusion of footprints in the snow when the singers moving around the stage. In addition, the stage itself, like Denmark and the Eurovision Island, is lined with the water: In a vast pool around the stage there are 40 m3 of water, which can be used both as swimming pool and as a launching platform for fire and fireworks. With less than two weeks till the Eurovision Song Contest 2014 in B&W Hallerne, Host City Copenhagen presented a comprehensive event programme for the city’s public celebrations. Johnny Logan will perform an open air concert in Eurovision Village, the city’s harbour bath invites everyone to join their Eurovision Cool Pool Party, the AIDS Foundation will attempt to create the world’s biggest kiss chain down the Fan Mile, and the City of Copenhagen will marry lovers in a CO2-neutral canal boat. 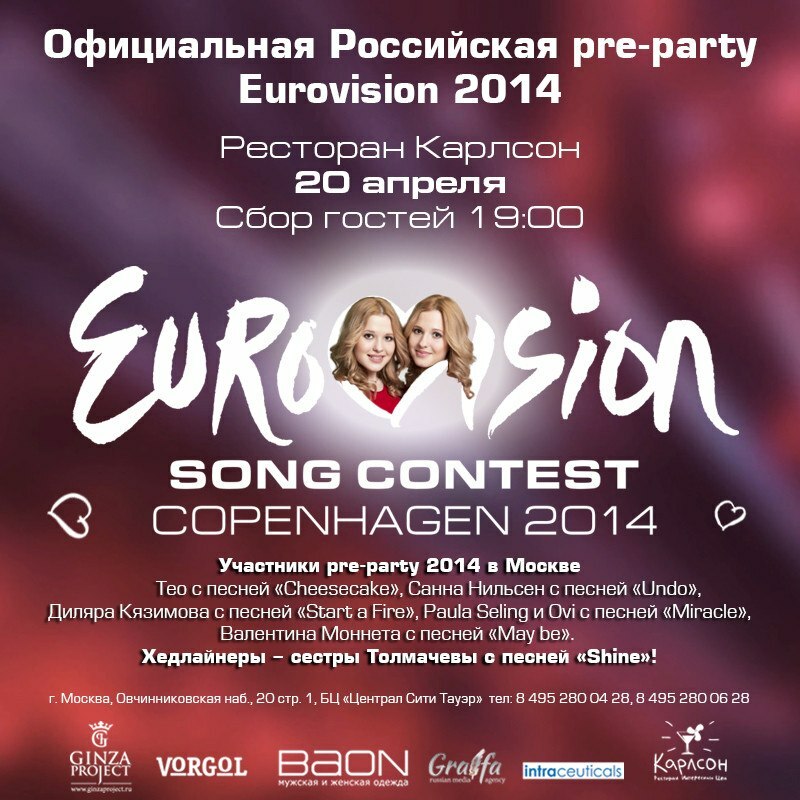 The event programme for the Eurovision Song Contest 2014 in Copenhagen offers approx. 180 events from 24 April to 11 May. Choose from guided tours, dance performances, parties, films, concerts, musicals and public viewings of both the semi-finals and the final. In addition to the music performances, Eurovision Village will present an organic​​ street food and free tap water area. A green urban space focuses on the city’s green solutions with fun and educational environmental activities for children. Kids will also be able to cut loose in the kids’ zone, and 7 May has been declared Kids’ Day with children’s music and entertainment on stage in Eurovision Village. And the party in Eurovision Village will be sending out good vibrations to the rest of Copenhagen. 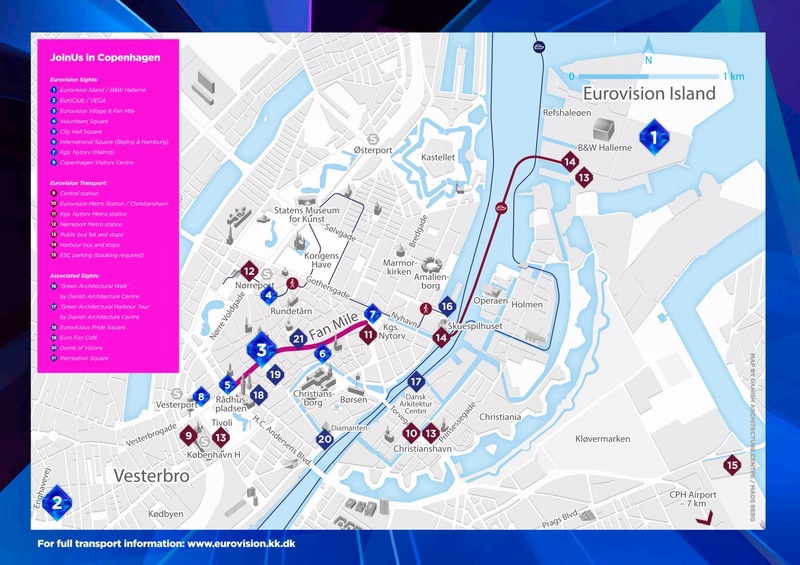 The Eurovision Fan Mile will run along the shopping street Strøget from City Hall Square, where Eurovision 2000 winners, Olsen Brothers, will play before the official opening ceremony and red carpet event 4 May. On Eurovicious Pride Square, Copenhagen Pride will host political debates and entertainment from Copenhagen’s LGBT community. In the city’s side streets, several of the city’s bars have seized the opportunity to throw a party, while LGBT film festival MIX Copenhagen will show a film at Grand Theatre and party in the Meatpacking District. Eurovision Fan Mile will have a few surprises up its sleeve. This could be random pop-up events such as a three-minute ABBA or Lordi rave by one of the 10 fan-selected tribute banners. As the first Eurovision host city ever Copenhagen has invited a number of partner cities to the party. On International Square, on Højbro Plads, one will thus be able to experience Chinese performing arts and German karaoke side by side. The Fan Mile ends at Kongens Nytorv square, where last year’s host city Malmö will do a pop-up picnic and light installation on the way to the harbour buses that will sail people from Nyhavn harbour to the Eurovision Song Contest on Eurovision Island. For those who do not have tickets to the shows, there will be ample opportunity to keep up on the big screen in a number of locations. There will be public viewings of the semi-finals 6 and 8 May and the final on 10 May in Eurovision Village. The final can also be seen at City Hall Square. Read more about Eurovillage and Fan Mile activities here. Huset-KBH changes its name to Euro Fan Café from 28 April to 10 May and offers everything a die-hard Eurovision fan’s heart desires: Fan parties, films, public viewings, talk shows, even a treasure hunt, and the programme’s only concert with last year’s winner Emmelie the Forest. Access requires a ticket. Read more about Euro Fan Café here. House of Music VEGA in Vesterbro in Copenhagen houses a somewhat different genre than usual, when it opens its doors to this year’s Euro Club – the nightclub for delegates, accredited press, super fans and artists. Here you will need to be accredited to get in and party with the Eurovision VIP’s. If you are a member of the OGAE fan club, you will be able to retrieve one-day-wristbands from 28 April at 14:00 at Copenhagen Visitors Centre. Read more about Euroclub here. Many of the capital region’s cultural institutions have also jumped at the opportunity and offer Eurovision-related cultural experiences. Some of the more outstanding events count a Eurovision Cool Pool Party at Islands Brygge Harbour Bath, the AIDS Foundation’s attempt to beat the world record for the longest kiss chain, the domed greenhouse Dome of Visions and a Eurovision-inspired concert with Bottle Boys in the underground Cisterns. Take the programme with you on the go by downloading the free mobile app “Join Us in Copenhagen” in App Store. The mobile app is available in Danish and English and works offline. 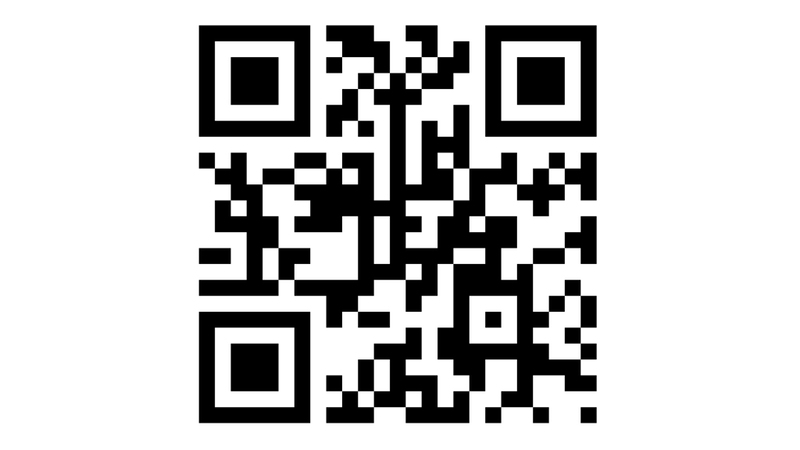 The programme is also available at http://www.joinusincopenhagen.com, which can be accessed from your phone. On Eurovision Fan Mile one will also be able to find highlights from the programme at information stands and a printed programme newspaper. The host city programme runs from as early as 24 April, with most events from 4-11 May. The programme consists of both official host city events, as well as events organised by the city’s cultural institutions. Carl Espen (Norway), Kasey Smith (Ireland), Twin Twin (France), Aram Mp3 (Armenia) have recorded their messages for Romanian colleages Paula and Ovi - watch them here. Irish Kasey Smith has also recorded support message for Teo from Belarus - watch it here. Ukrainian Mariya Yaremchuk has recorded a video message to Estonia - watch it here. "Why do we always look back in time? Why not to do an act that is about how Eurovision will look like in the future? As a futuristic singing competition in space spiced with fun ingredients like aliens dancing in the background or just head on the robotic bodies that sings?" 29-years old Majers from Cologne, a fan who has already attended shows in Oslo, Dusseldorf and Malmö, now has been invited by DR to attend the show as credit to his idea. "I am very honored to contribute to the show", he says. "We have based our act on his idea and then given it our own interpretation, and it's going to look really good on stage, I can promise", says Head of Show Jan Lagermand Lundme. To implement the story of the "Eurovision 2075" has been invited famous Nikolaj Cederholm - playwrighter, director, actor and theater director. He will do it as a theater show with participation of actors: Jimmy Jørgensen, Claus Hempler, Bjørn Fjæstad, Mark Linn, Annika Aakjær and Louise Hart. • Over 180 million viewers from across Europe and the world are expected to tune in for the two Semi-Finals and the Final. Official Eurovision fan-clubs, members of OGAE Network continue casting their votes for the Eurovision 2014 artists. With 502 votes counted in total and not less than 30 countries covered, OGAE Rest of the World vote is one of the largest on board. Hungary, Montenegro, Slovakia, Czech Republic, Kosovo, South Africa, Namibia, Nigeria, Kazakhstan, South Korea, Japan, Australia, New Zealand, Papua New Guinea, Tuvalu, Solomon Islands, Canada, USA, Mexico, Costa Rica, Colombia, Argentina, Brazil, Peru, Panama, Bolivia as well as extra club members from Russia, UK and Austria. 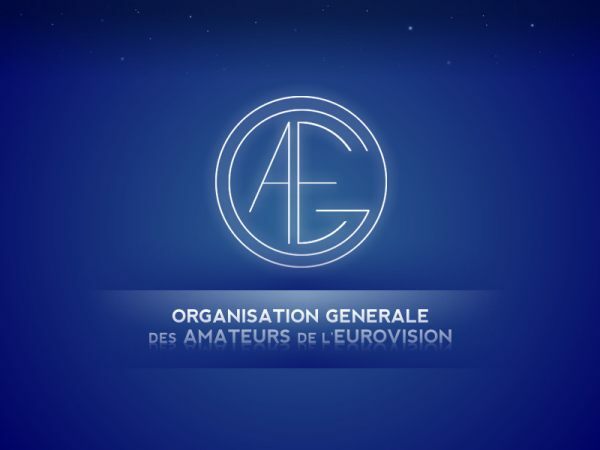 Separate results of the voting of Venezuela, Kosovo, South Africa, Namibia, Tuvalu, Brazil, Colombia, Costa Rica, Argentina, Canada, Hungary branches are available on OGAE RoW facebook page - being the most visited OGAE related Facebook page with more than 5000 subscribers and covering all the latest news from OGAE and Eurovision. Previous winners of OGAE RoW polls were: San Marino (2013), Iceland (2012), Poland (2011), Romania (2010), Lithuania (2009), Belarus (2008), Iceland (2007). Award will be handled to Sanna Nielsen during one of her press-conferences in Copenhagen. You can track the progress of OGAE International poll on OGAE website or on ESCTracker. On April 20 in Moscow at the restaurant "Karlson" will be held traditional official Russian pre-party of Eurovision Song Contest 2014. With concert and most anticipated party of this spring Tolmachevy sisters and their friends will open summer terrace of restaurant Karlson, where guests will be able not only to communicate with musical ambassadors of Eurovision 2014 from Russia and other countries, but also to enjoy a magnificent view of the evening Moscow. As always guests of the music festival will be many star fans of the contest, finalists of the past years and simply not indifferent to the good music people. General partner of the Russian pre-party Eurovision this year is the clothing chain BAON. The participants of Eurovision 2014 and "BAON" will unite in the charity project "Share smiley - save lives". Besides performances, participants of the party will also present a special collection of T-shirts "BAON SMILEY", part of the proceeds from the sale of which will go to the Foundation "Life Line". Action "Share smiley - save lives" will be held from April 10 in all stores of BAON and help save the lives of children with heart diseases. Among other guests of the pre-party are expected: Philipp Kirkorov, band "PM", Natalia Podolskaya, Dmitry Koldun, Alsou and others. Девизом ESCKAZ являетcя "Узнайте новости Евровидения первыми!". Как обычно, наша команда официально аккредитована и будет освещать в полном объеме всю "Евронеделю". В этом году мы вновь планируем вести практически независимые англо и русско-язычные блоги - в нашей англоязычной команде к Майку и Даниелю на этот раз присоединится специально приглашенный блоггер Дими, а русскоязычную команду возглавит, как обычно, главный редактор сайта Андрей Михеев. Ежедневно, с 25 апреля по 11 мая на БЛОГЕ ESCKAZ.com из Копенгагене вы сможете практически в прямом эфире ознакомиться с самой свежей информации со столицы Евровидения: отчетами о репетициях, пресс-конференциях участников, о фанатских и иных мероприятиях. Мы также планируем рассказывать о событиях проходящих в городе вне пресс-центра и арены. Прошлые репортажи ESCKAZ.com с места событий были неоднократно номинированы на премию Лучший Блог о Евровидении, мы постараемся выдерживать высокий стандарт подачи информации и в 2014 году. Не забудьте также подписаться на наши аккаунты в Twitter и Instagram - ваши источники свежих новостей о конкурсе. Полный календарь репетиций, пресс-конференций и иных событий вы можете на гиде ESCKAZ по организации конкурса 2014 года. Эта страница не будет обновляться на Евронеделе, поэтому заложите закладку на адрес нашего блога. Как обычно, незадолго до конкурса команда ESCKAZ публикует рейтинг участвующих песен по версии сайта. Этот год не отличается от предыдущих, как обычно, обозревателями в этом году выступят эксперт в области конкурса Евровидения Андрей Михеев и британские редакторы сайта Майк и Дэниель. Мы также представляем вам итоговый результат голосования посетителей сайта ESCKAZ 2014 года. C субботы делегации Евровидения начинают собираться в Копенгагене, а первые репетиции начнутся в понедельник - время подвести итог нашему освещению промежуточного периода между сезоном национальных отборов и евронеделей. Итак, вкратце, кто фавориты на победу в этом году? Букмекерские коэффициенты показывают, что Евровидение вернется на Кавказ, и впервые в истории отправится в Армению. Она возглавляет топы букмекеров со дня презентации песни Арама Mp3. В настоящее время ставки на Армению принимаются с коэффициентами 6/5-6/4. Швеция последнее время сокращала отрыв, и в настоящее время на нее можно поставить с 2-5/2. За ними следуют Дания, Норвегия, Великобритания и Украина, которая является самой высокой из стран СНГ. Азербайджан идет на 8м, Россия на 13м, а Беларусь, Молдова и Грузия считаются аутсайдерами конкурса. Швеция лидирует с огромным отрывом в голосовании Фан-клубов Евровидения. В топ 5 в настоящее время входят Австрия, Венгрия, Израиль и Великобритания. Армения в настоящее время на 6м месте. Последние результаты будут оглашены утром понедельника 28го апреля. Фанатские опросы понемногу вырождаются и теряют эффект, особенно с введением голосования ОГАЕ, но наиболее активные на сегодня ESCStats и ESCNation показывают одинаковые топ 3: Великобритания, Швеция и Венгрия, хотя и в разном порядке. Армения идет на 4-5 месте. Мы также обычно отмечаем артистов с самыми большими промо-турами. Туры полностью потеряли свое значение за последнее время, поскольку выяснилось, что они не приносят какого-либо влияния на результаты конкурса. Однако, представитель Армении посетил перед Евровидением 10 стран, а участница из Азербайджана - 6. Мы также чрезвычайно горды тем, что в подготовительном сезоне в этом году нам удалось взять интервью у 36 из 37 участвующих артистов (к сожалению, кроме Италии). Это примерно на 10 интервью больше, чем у других сайтов, посвященных конкурсу Евровидение. Датская пресса сегодня впервые была приглашена внутрь B&W Hallerne, чтобы увидеть своими глазами сцену Евровидения 2014. Она была представлена руководителем шоу Яном Лагермандом Лундме и продюсером Пером Закариассеном на пресс-конференции в B&W Hallerne на Рефсахлеюне. Сцена Евровидения состоит из иллюминированного куба, который время от времени может становиться прозрачным. За ним находится сцена из световых установок и LED экранов - а впереди сцена окружена водой. Вдохновение дизайнер Клаус Зиер черпал с вида носа корабля, рассекающего воду. Сцена - это большой "куб" созданный таким образом, что каждый из 37 артистов может как находиться в центре его, или выйти вперед к толпе в 10 тысяч зрителей. Сама сцена шириной 35 метров и высотой 20 метров, с подиумом, выдающимся на 16 метров вперед зала. Позади ее находится огромное LED-крыло, 100 метров в длину и 13 метров в высоту, котоое может демонстрировать изображение и анимацию во время шоу. Огромный куб создан из 120 мелких кубиков, и покрыт специальным отражающим слоем, который придает кубу различные возможности: он может быть прозрачным, и можно смотреть насквозь куба и видеть LED-экран позади его, и также можно его использовать для проецирования на нем изображений и видео, таким образом превращая куб в небольшую закрытую комату. В куб вмонтированы 10 танцполов, на которые можно подняться с помощью высоких лестниц на обратной стороное куба. Пол сцены также может быть использован для создания визуальных эффектов: он состоит из LED плоскости размером 13 на 13 метров, которая работает как тач-скрин, например, может создавать иллюзию следов на снегу, когда исполнители двигаются по сцене. В дополнение к этому, сцена, как и сама Дания и остров Евровидения, окружена водой: бассейн вокруг сцены содержит 40 кубометров воды, которую можно использовать как для плавания, так и в качестве платформы для запуска феерверков. До концертов Евровидения в B&W Hallerne остается уже совсем немного времени, и сегодня Host City Copenhagen опубликовал полную программу городских мероприятий на две недели Евровидения. Джонни Логан выступит в Евродеренвне, баня в городской гавани пригласит всех окунуться в Eurovision Cool Pool Party, Фонд борьбы со СПИДом предпримет попытку создать рекордную цепочку поцелуев на Фан-миле, а муниципалитет Копенгагена будет женить ЛГБТ пары на туристических лодка. Всего программа этих недель с 24 апреля по 11 мая включает в себя более чем 180 меропритиятий, таких как туры с гидами, танцевальные выступления, вечеринки, фильмы, концерты, мюзиклы и просмотры шоу Евровидения на огромных экранах. В дополнение к музыкальных выступлениям, в Евродеревне будет предлагаться органическое уличное питание и бесплатная вода из под крана. Упор будет делаться на экологические решения в городе и специальная образовательная программа в этом направлении будет предлагаться детям. Дети также смогут развлекаться в специальной детской зоне, а 7 мая провозглашено полностью детским днем с детской музыкой и развлечениями на сцене в Евродеревне. Вечеринки в Евродеревне будут отправлять позитивные вибрации остальному Копенгагену. Вдоль торговой улицы Стрёгет будет проложена Фан-миля Евровидения. Она начнется от Городской ратуши, где победители Евровидения 2000, Olsen Brothers, выступят перед официальной церемонией открытия конкурса и красной дорожкой 4го мая. На Eurovicious Pride Square, ЛГБТ организация Copenhagen Pride будет проводить политические дебаты и развлекательные мероприятия, посвященные ЛГБТ сообществу. В других частях города, ряд из баров и клубов также решили присоединиться к программе Евровидения. На Фан-миле всех ждет множество сюрпризов. Это могут быть короткие 3-х минутные трибьюты ABBA или Lordi рядом с баннерами, посвященными 10ти лучшим песням Евровидения, выбранным фанатами. Копенгаген также пригласил для создания мероприятий в городе ряд других братских городов. На Международной площади, Хёйбро Пладс, гости смогут посмотреть на китайское искусство или спеть в немецком караоке. Фан-миля завершается на площади Конгенс Нюторв, где прошлогодний город-организатор Malmö проведет поп-ап пикник и инсталляцию по дороге к остановке водных автобусов, которыми люди будут передвигаться из Нюхавна на остров Евровидения. Для тех, у кого нет билетов на шоу, будет масса возомжностей увидеть конкурс на больших экранах в городе - полуфиналы и финал можно будет смотреть в Евродеревне, а финал также на площади возле Городской ратуши. Подробнее о мероприятиях Евродеревни и фан-мили вы можете прочитать здесь. Huset-KBH сменит свое имя на Euro Fan Café с 28 апреля по 10 мая, он предлагает все, что интересно преданным поклонникам Евровидения: вечеринки, фильмы, просмотры шоу, ток-шоу, даже городской квест, а также единственный концерт победительницы прошлого года Эммели Де Форест. Вход платный. Подробнее об Euro Fan Café вы можете узнать здесь. Клуб VEGA в Вестербро тоже сменит свой стиль, и примет Евроклуб - официальный клуб для участников конкурса и делегаций, аккредитованной прессы и главных фанатов конкурса. Для попадания сюда нужно иметь аккредитацию. Если вы являетесь членом ОГАЕ клуба, вы сможете приобрести однодневные входные браслеты. Подробнее о Евроклубе можно прочитать здесь. Множество из культурных институтов столицы также присоединились к возможности и предлагают различные мероприятия, связанные с конкурсом. Среди них - Eurovision Cool Pool Party в Бане в гавани Islands Brygge, попытка Фонда борьбы со СПИДом побить мировой рекорд цепочки поцелуев, теплица под куполом Dome of Visions и концерт композиций Евровидения от группы Bottle Boys в подземной цистерне. Программу вы можете всегда иметь с собой, если вы скачаете для iPhone в App Store мобильное приложение “Join Us in Copenhagen” in App Store. Оно доступно как на датском, так и на английском и работает оффлайн. Также программу можно найти на http://www.joinusincopenhagen.com, который также можно посещать с телефона. На Фан-миле можно будет найти информацию о программе мероприятий на специальных фан-стендах, а также в специальной газете. Мероприятия с тематикой Евровидения начнутся с 24 апреля, но основная их часть придется на 4-11 мая. Карл Эспен (Норвегия), Кейси Смит (Ирландия), Twin Twin (Франция), Aram Mp3 (Армения) записали свои послания участникам из Румынии Пауле и Ови - увидеть их можно здесь. Ирландка Кейси Смит также записала видео в поддержку представителя Беларуси Тео - здесь. Украинка Мария Яремчук свое видео послание обратила к жителям Эстонии - здесь. "Почему мы вечно смотрим назад, на историю Евровидения. Почему бы не сделать номер, показывающий то, как Евровидение будет выглядеть в будущем? Футуристический конкурс в космосе с забавными моментами, например танцующими инопланетянами или поющими головами на телах роботов?" 29-летний Майерс из Кельна, фанат конкурса, который уже посещал шоу в Осло, Дюссельдорфе и Мальме, был приглашен DR посетить конкурс за счет организаторов в знак признательности его идее. "Я польщен тому, что смог внести свой вклад в его создание", говорит он. "Мы основываем номер на его идее, и дали ей собственную интерпретацию, поэтому на сцене она будет выглядеть здорово, я обещаю", говорит руководитель шоу Ян Лагерманд Лундме. Для воплощения сюжета "Евровидения 2075" был приглашен известный режиссер Николай Цедерхольм, который создаст театральное шоу вместе с актерами: Jimmy Jørgensen, Claus Hempler, Bjørn Fjæstad, Mark Linn, Annika Aakjær и Louise Hart. • Ожидается, что за конкурсом будут следить свыше 180 миллионов зрителей со всей Европы и других стран мира. Официальные фан-клубы Евровидения, члены сети ОГАЕ, продолжают объявлять результаты своего голосования за участников Евровидения 2014. С 502 подсчитанными голосами и не менее чем 30 проголосовавшими странами, голосование ОГАЕ Остальной мир является одним из крупнейших в системе. Венгрия, Черногория, Словакия, Чехия, Косово, Южная Африка, Намибия, Нигерия, Казахстан, Южная Корея, Япония, Австралия, Новая Зеландия, Папуа Новая Гвинея, Тувалу, Соломоновы Острова, Канада, США, Мексика, Коста-Рика, Колумбия, Аргентина, Бразилия, Перу, Панама, Боливия, а также несколько дополнительных членов клуба из Великобритании, России и Австрии. Отдельные результаты голосования Венесуэлы, Косово, Южной Африки, Намибии, Тувалу, Бразилии, Колумбии, Коста-Рики, Аргентины, Канады, Венгрии вы можете найти на странице ОГАЕ Остальной мир в Facebook - крупнейшей Facebook странице в ОГАЕ с более чем 5000 подписчиками, и самыми свежими новостями из мира Евровидения и системы ОГАЕ. Прошлыми победителями голосований ОГАЕ Остальной мир были: Сан-Марино (2013), Исландия (2012), Польша (2011), Румыния (2010), Литва (2009), Беларусь (2008), Исландия (2007). Приз победительнице голосования Санне Нильсен ОГАЕ Остальной мир вручит во время одной из пресс-конференций в Копенгагене. Вы можете следить за прогрессом общего голосования системы ОГАЕ на сайте ОГАЕ или на ESCTracker. На крыше ресторана Карлсон отгремела традиционная официальная российская pre-party самого масштабного международного песенного конкурса EUROVISION, который в этом году пройдет в датском городе Копенгаген. Главными героинями праздника, как и заведено, стали конкурсантки от России, сестры Настя и Маша Толмачевы, которые уже становились победительницами детского конкурса Евровидение в 2006 году. Поддержать сестер Толмачевых и весело, с настоящим русским размахом проводить участников EUROVISION на самый громкий песенный конкурс Старого света, пришли многочисленные друзья, коллеги, конкурсанты прошлых лет, настоящие фанаты конкурса из разных стран, а также король отечественной поп-музыки, автор песни «Shine» Филипп Киркоров. Самая громкая вечеринка весны прошла при поддержке бренда городской одежды BAON и впервые собрала в Москве рекордное количество конкурсантов 2014 года из разных стран. Открыл громкую музыкальную вечеринку весны самый известный российский битбоксер Вахтанг, который задал правильное настроение и подготовил зрителей к выступлению конкурсантов. Затем на сцену поднялся посол Дании в России Томас Винклер, чтобы поприветствовать конкурсантов и пригласить всех поклонников Евровидения в гостеприимный Копенгаген на полуфиналы и финал самого любимого европейского музыкального конкурса. Конкурсанты этого года приняли участие в пресс-конференции для СМИ, обменялись подарками, а Маша и Настя Толмачевы угостили своих гостей традиционными пасхальными куличами. «Настя и Маша – наши две яркие звездочки, которые уже через десять дней засияют на весь мир, - рассказал журналистам и гостям о своих подопечных Филипп Бедросович. – Они большие молодцы, талантливые и просто замечательные, я горжусь ими. Однажды им удалось покорить Европу, уверен, что это удастся им и в этот раз. Также на конкурсе буду болеть за представителя Белоруссии TEO, я знаком с ним и с его песней, буду очень рад увидеть его в финале». «25 апреля выйдет наш новый клип на песню «Shine» с которой мы надеемся покорить Европу, – признались сестры Толмачевы после выступления. – Важнее музыки может быть только семья. Надеемся, что конкурс Eurovision пройдет вне всех политический конфликтов. Мы очень надеемся на вашу поддержку и постараемся сделать все, что в наших силах, чтобы представить нашу родную и любимую Россию на должном уровне! Вообще мы такие, какие есть. Мы не придумывали никакого имиджа — «ангелочки» и «домашние девочки», мы ничего из себя не изображаем. Мы просто хотим со всеми подружиться и обрести бесценный опыт. В этом и есть главная суть «Евровидения» - много музыки, общения и объединение людей из разных стран». Среди почетных гостей официальной pre-party Eurovision – 2014 и ресторана Карлсон были замечены Филлип Киркоров, Геннадий Гохштейн, Регина Фон Флеминг, Авраам Руссо, Яна Чурикова, Артур Гаспарян, Ирина Забияка, Настя Макеева, Глеб Матвейчук, Алена Свиридова, Дмитрий Бикбаев, Виктория Боня, Руслан Алехно, Паша Парфени, Дакота, Сергей Пудовкин, Владимир Широков, Илья Ярошенко и многие другие. «Я очень рада, что в этом году Россию на Евровидении еще раз представят наши близняшки сестры Толмачевы, - поделилась своим мнением Яна Чурикова. – Я смотрела их выступление на детском Евровидении в 2006 году, и уверена, что и в этом году они будут одними из лучших, и никакие политические аспекты не повлияют на результат голосования». 15. Черногория Sergej Ćetković Moj svijet Sergej Ćetković - Sergej Ćetković, Emina Jahović Sandal.